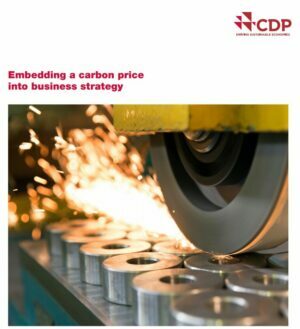 Internal carbon pricing is moving from theory to practice with take up at more than 1,200 companies, a 23% increase year on year, with close to 150 embedding a carbon price deep into their corporate strategy, according to the latest research by CDP, the global climate change disclosure non-profit. In Europe the number of companies applying an internal price on carbon or planning to do so represent 32% of companies worldwide, with companies in the UK (120), France (54) and Germany (45) leading the way in disclosing their use of this carbon-risk accounting tool. Nearly 40 major multi-national companies with a combined market cap of €1.3 trillion have disclosed a tangible impact to their business as a result of internalizing a cost on carbon. They describe a variety of ways in which this tool has directly shifted investments toward energy efficiency measures, low-carbon initiatives, energy purchases, and the development of new low-carbon product offerings. Novartis and SUEZ are selecting major GHG reduction projects and measures based on the cost savings they generate, as determined by their internal carbon price. Societe Generale has saved EUR 13 million on overheads with a EUR10/tCO2e over three years. Nissan and Anglo American use an internal carbon price to stimulate research and development into low carbon technologies such as fuel cells. These companies have seen the value of an internal price on carbon in helping make the business case for low-carbon investments, and are now shifting their use of the tool towards delivering company-wide strategic advantage and meeting their climate targets. CDP’s report includes a series of new case studies detailing how internal carbon pricing is being embedded into corporate strategy. This year’s CDP disclosures come against a backdrop of growing momentum to address global warming pollution by national and local governments, new drivers like China’s impending carbon market, and the recent ratification of the Paris Agreement by the US, Brazil and China. Last year the number of companies pricing their carbon emissions tripled, continuing a rise from just a handful in 2013. Over 175 nations have signed the Paris Agreement, in the process of ratification, agreeing to limit the global average temperature rise to well below 2°C above pre-industrial levels, with over half of these planning to use carbon pricing and other market mechanisms to achieve their emissions reduction goals. Companies are recognizing the strong signals: data released by CDP today, shows that over 600 major international corporations with a combined market cap of over €10 trillion are already starting to factor the Paris Agreement in their business plans weeks before the major environmental legislation becomes law. Despite the momentum post Paris however, at least 500 companies who potentially face direct regulatory risks (due to their sector or geography) disclosed to CDP that they do not have, or even plan to implement, an internal carbon price within their business, which may concern some investors. “As a long-term investor, CalSTRS takes climate change very seriously and is focused on mitigating potential permanent capital losses and adversely affected investment returns across our portfolio. This newly-released data from CDP is vitally important for the entire shareholder community as we hold portfolio companies accountable in managing and disclosing climate change risks, and ultimately demonstrating they are prepared for a low-carbon economy,” says Jack Ehnes, CEO, California State Teachers’ Retirement System (CalSTRS). Hey Buddy!, I found this information for you: "Major multinationals at forefront of drive to price carbon and meet climate targets but many companies still unprepared". Here is the website link: https://www.duurzaam-ondernemen.nl/major-multinationals-forefront-drive-price-carbon-meet-climate-targets-many-companies-still-unprepared/. Thank you.